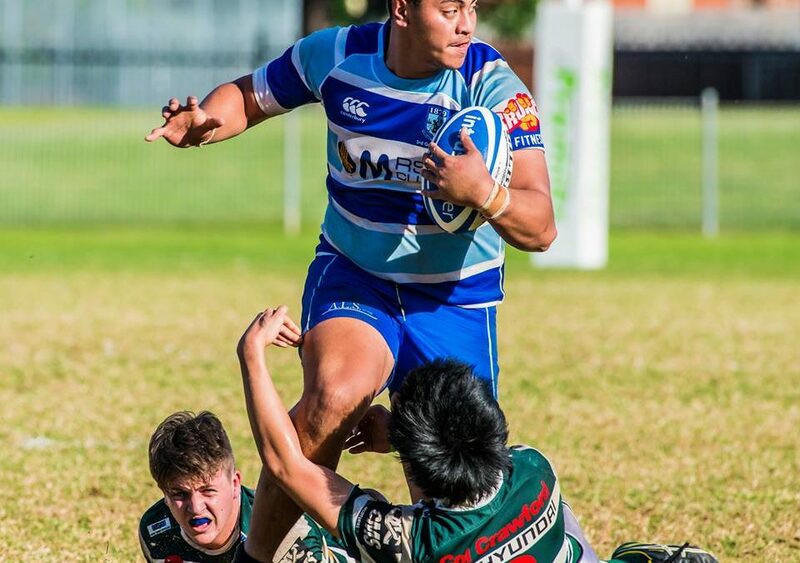 In the 79th minute of the match, from the restart after a Warringah try, a Warringah player shows the ball once, and then runs 40 metres to score again. Pretty much says it all. But back to the start. The playing surface at Rat Park looks in good nick, and the weather, although a bit cloudy, is fine and mild. Warringah has generously provided the Two Blues board with a corporate box, which is really just a row of seats, but with a rather substantial bench in front of it, on which the apprentice can rest his notepad and his glass of red. The corporate box comes complete with free refreshments, and the only real disadvantage is that it is at the far southern end of the grandstand, so that getting a clear view of what happens at the northern end is not easy. However Warringah’s hospitality is great, with its President Phil Parsons, and Rats’ legend Chris Birch, taking good care of the visitors. The occasion is also memorable because Andrew Cox has chalked up a Two Blues club record of first grade games played as captain. Coxy runs out on the field well in front of the rest of the team, to loud applause, in his 152nd game. Parramatta kick off, running north. Initially it looks as though the boys might spring a surprise, but an opportunistic move breaks down when the Parramatta player is judged to have touched the ball on its way over the touchline to what would have been a good lineout attacking position. Waldo Wessels is, as usual, darting about trying to find a hole through the defence. There is almost a try, but close is not good enough. Warringah then attacks and the try is only denied by a great tackle in the goalmouth. However following a Parramatta kick downfield, the chase is not good, and a Warringah player runs half the length of the field, scoring in the south-eastern corner. The try is converted and, after seven minutes, Parramatta is down 0-7. However after the restart Parramatta quickly regains the ball, and Tyrone Viiga crashes over for a try. With Jaline Graham’s conversion, the scores are level, 7-7. In the process, David Lolohea, who had a standout performance throughout the match with his bullocking runs, has poleaxed a Warringah player, who lies motionless on the turf or nearly five minutes, before being stretchered off. As the first half unfolds, however, Parramatta’s missed tackle count starts to rise, and with about 15 minutes gone, Warringah win a lineout and go over for their second try, taking the score to 7-12. The conversion attempt strikes the post, but still goes through: 7-14. For the next ten minutes play seesaws in midfield, but eventually Warringah apply the pressure, and from a scrum near Parramatta’s line, score a pushover try. With the conversion, 7-21, and 25 minutes gone. Both sides are having their chances, but missing them. Parramatta misses one when what appears to be a deliberate knock down from a lineout goes unpenalised. And, just before halftime, Robert Duff stops a further Warringah score when he bumps a player flying down the sideline, using the player’s momentum to send him into touch. At half time the score remains 7-21. The game is not out of reach, but continuity needs to improve. The halftime lecture from coach Greg focuses on the breakdown. We keep losing the ball at the breakdown, and without continuity, we cannot score. Second half, and Warringah kick off toward the south. Almost immediately, Parramatta are under pressure and David Lolohea, continuing his great form, lands a long-range kick a few centimetres inside the touchline before it bounces out. Unfortunately, the halftime lecture doesn’t seem to have had much impact. Only five minutes are gone in the second half before Parramatta turns the ball over again, leading shortly to another Warringah try. This time the Warringah kicker is off target, and the score is 7-26. Warringah has settled into a pattern, and Parramatta doesn’t seem to have an answer. Like Walter Lindrum moving the ball steadily up the side of the billiard table through repeated cannons off the cush, Warringah is moving steadily upfield, gaining territory through kicks, and then winning the lineouts. It’s not that Parramatta doesn’t have its opportunities, it’s just that it can’t seem to turn them into points. Another memorable run by David Lolohea, incorporating what is now known as the Fijian sidestep, is followed by a rolling maul, but eventually it starts to roll backwards. Parramatta are keeping the pressure on: they spread the ball wide, get within about three metres, but cannot get across the line. Then, with about 25 minutes gone in the second half, we get what we least need: a red card. From a towering Parramatta kick, Jonathon Malo is sent from the field for tackling the Warringah catcher in the air. Inevitably there is a penalty, this leads shortly to another Warringah try. Score 7-33 with the conversion. As always, the boys never give up, but they have a mountain to climb with 14 men on the field, and Warringah with a 26-point lead. And, as often happens, the gap widens as full-time approaches. Warringah scores two more converted tries, the last a minute before full-time. Final score 7-47. Parramatta-Warringah games are played, as Two Blues diehards will know, for the Noddy Sawtell Cup, Noddy having been a long-serving player with both clubs. The presentation, held as a lambent glow from the sunset creeps over the ocean clouds and contrasts with the darkening field, seems rather sombre. The effort was there, but the points on the board signal deficiencies in cohesion and composure. Next week: West Harbour at home. We’re halfway through the season, and this is a game we must win!